So far it looks as though I'll probably stay behind on my Who Do You Think You Are? posts. I think I'll set a goal of posting about an episode before the second one after it airs. Maybe I can stick to that. This one took extra time because I worked hard at tracking down online links to some of the information presented in the episode. The Scott Foley episode of Who Do You Think You Are? introduced me to another celebrity I hadn't heard of previously. The teaser told us that Foley would discover his family had an impact on critical events in U.S. history and that a relative put his life on the line for one of America's founding fathers. He would also learn about an ancestor who suffered unspeakably during one of America's darkest times. Scott Foley is an actor whose first breakthrough role came on the Felicity series (never seen it). According to the hyped-up intro, he has become one of television's most sought-after stars. Other series on which he has appeared are Scrubs (I actually used to watch that in syndication), The Unit (nope), True Blood (nope), and Scandal (and nope). Foley lives in Los Angeles with his wife, actress Marike Domińczyk, and their three children. In one of the family shots, the Foleys' younger son takes his first steps, and Foley calls out to the cameraman, "Tell me you got that!" The camerman confirms, "Got it!" Nice to know that this program can serve a greater good. Foley opens by telling us that the older he gets, the more important family is to him. His wife is from Poland; they know and see her family regularly, and she speaks in Polish to the children. He is proud of being American, but his wife knows her background and he doesn't. It's important for him to learn what he brings to the relationship and where he comes from. Foley says his father "was" Hugh Henry Foley (which made me think he had passed away, but he shows up later, so it was just a poor choice of wording) and his mother was Constance Jean Foley (whoops! look at that disappearing maiden name). Foley is the oldest of three brothers. Hugh Foley worked in banking, and the family moved a lot. They didn't really know any cousins, aunts, or uncles; life was just the immediate family. When Foley was 15 his mother passed away from ovarian cancer, from which she had suffred for three to four years. This of course affected the whole family. They didn't talk much about family history. Foley only knew one of his grandparents, his paternal grandfather, Earl Hugh Foley. He knows his paternal grandmother was Evelyn Fogg, and his father has said that they can trace their family back to the American Revolution through her. Foley himself, however, doesn't know anything. To embark on this genealogical journey, Foley gets together with his father to talk, probably at Foley's home, because it looks as though his father is the one arriving. He starts out asking about Evelyn Fogg and the story that her family could go back to the American Revolution. His father confirms that and says maybe it could go further. He was told that if he had any daughters, they would be eligible for DAR, the Daughters of the American Revolution (I guess no one was enthusiastic about having the sons join Sons of the American Revolution? ; maybe they need better marketing). Foley asks what DAR does, and his father says they trace families back to the Revolution (isn't that enough?). Throughout this segment Hugh tends to mumble and keep his eyes looking down; he obviously was not comfortable with the camera around. Then Hugh shows Foley a photo of his grandfather Harry Fogg — Evelyn's father and Foley's great-grandfather — and says it was through his wife that the Revolution lineage came. He doesn't know her name, however. (The back of the photo has "Harry Fogg Grandfather on mother's side @ 1910-1915" in pencil.) He has a vague recollection that her maiden name might have been something like Wadworth. Foley comes up with a brilliant idea: Maybe DAR has a Web site they can search? His father says he doesn't know anything about computers, so he can't help. Foley quickly finds the site and searches for Wadworth, with no results. He asks his father whether it could have been Wadsworth and searches for that. Whoops, that gives 50 results, too many to figure out. After commenting how little they know about their family, Foley decides that maybe he should go to DAR to start his research. He looks on the site and learns that it's in Washington, D.C., so that's where he's headed. (He's never heard of a research plan, has he?) He tells his father, "I will do all the research I can" (which must be the opposite of the royal we). With the 50 Wadsworths on the DAR site, Foley didn't know what to look for. He's excited about learning his family's ties to history and thinks that maybe he'll find something. In Washington Foley is being driven around (maybe even celebrities and big-budget television shows have trouble finding parking there). At the DAR library he meets professional genealogist Kyle Betit (who posted recently in one of my Facebook groups), whom he has previously told everything he knows about his family (which couldn't have taken long). And of course, Betit immediately points Foley to Ancestry.com, where Betit has magically created a family tree. When asked how he found the information, Betit says he primarily used vital records (which doesn't sound entirely plausible, considering the tree goes back to 1752). He notices that Simon was a private. Betit explains Simon is an approved patriot, meaning that his service during the war has been verified. 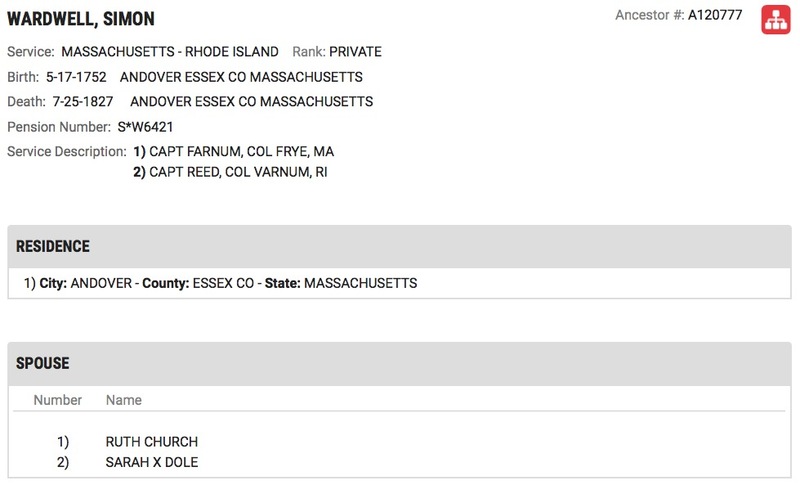 Foley then sees that Simon served from Massachusetts and Rhode Island, and that there's a pension number. He wonders if DAR has copies of the pension. Conveniently (since I don't think these are housed at DAR), Betit has one page of Simon's pension, his deposition about his service. The first thing Foley fixes on is the signature, which is large compared to the rest of the writing. He then does a very credible job of reading the early 19th-century handwriting. (This is available on Fold3.com, owned by Ancestry, so I was surprised it wasn't shown on the computer. More pages from the file are also there.) Only bits and pieces of this were shown on screen, and Foley did not read the entire text. I've transcribed the top part, through Simon's signature. 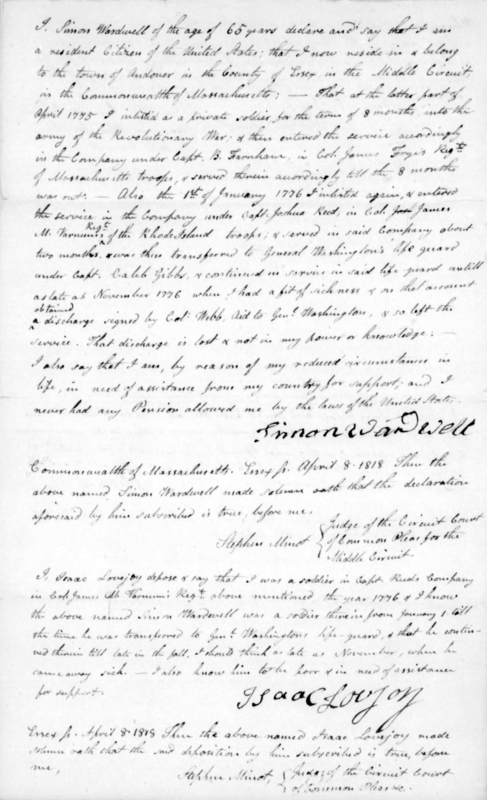 I, Simon Wardwell of the age of 65 years declare and say that I am a resident Citizen of the United States; that I now reside in & belong to the town of Andover in the County of Essex in the Middle Circuit, in the Commonwealth of Massachusetts; — That at the latter part of April 1775 I inlisted [sic] as a private soldier, for the term of 8 months, into the army of the Revolutionary War; & then entered the service accordingly in the Company under Capt. B. Farnham, in Col. James Frye's Regt of Massachusetts troops, & served therein accordingly till the 8 months was out: — Also the 1st of January 1776 I inlisted again, & entered the service in the Company under Capt. Joshua Reed, in Col. Jos James M. Varnum's Regt of the Rhode Island troops; & served in said company about two months, & was then transferred to General Washington's life guard under Capt. Caleb Gibbs, & continued in service in said life guard untill [sic] as late as November 1776 when I had a fit of sickness & on that account obtained a discharge signed by Col: Webb, Aid to General Washington, & so left the service. That discharge is lost & not in my power or knowledge. I also say that I am, by reason of my reduced circumstance in life, in need of assistance from my country for support; and I never had any Pension allowed me by the laws of the United States. The deposition was notarized on April 8, 1818, so Simon appears to have known his age pretty accurately. Foley reads about Simon's two enlistment dates and then focuses on the statement that he was transferred to Washington's "life guard" about March or April of 1776, asking if that was like the Secret Service. Betit says it was an elite unit whose mission was to protect Washington. Foley is absolutely blown away and wants to know more, such as what kind of relationship Simon had with Washington. Betit tells him that in March 1776 Washington was in Cambridge, Massachusetts, not far from where the two of them are at that moment (gee, only about 450 miles), and that he can set up an appointment with a Revlutionary War historian at the site of Washington's Cambridge headquarters. Foley leaves the building and flags down a car. He is amazed that his 5x-great-grandfather was in the Revolutionary War with Washington. He's learned only a little and already thinks he's entered a world of wonder. Now he wants to know more about Simon's service and what exactly he did. In Cambridge Foley walks up to the Longfellow House—Washington's Headquarters National Historic Site. Walking down from the house to meet him is R. Scott Stephenson, Ph.D., Director of Collections and Interpretation at the Museum of the American Revolution. (We've seen him previously on the Valerie Bertinelli and Angie Harmon episodes.) They introduce themselves and get some amusement out of the fact that they're both named Scott. Foley says that his 5x-great-grandfather Simon Wardwell was a member of Washington's life guard, and Stephenson responds that there's a project to document all of the men who were in the life guard, so he knows Simon's name. The life guard was partly a security detail to protect Washington himself, but it was also intended to proect Washington's papers, which had military secrets that the British would have liked to know. The Longfellow House was Washington's headquarters from July 1775 to April 1776. Simon probably stood guard in the area in front of the house where the two men are now standing. Foley finds himself surprisingly emotional about that. Inside the house, the Scotts are in a room used as Washington's reception room. Foley comments that Washington was the general in charge of the Revolutionary Army, but Stephenson corrects him, pointing out that when it began, it was not a revolution. At first Washington and the others were fighting to restore the rights they believed they were entitled to as British citizens. Washington was appointed as the commander of the army in June 1775. He knew at that point that fighting would go on for at least another year. He decided to form the life guard. Foley asks how Simon was chosen. Was there a vetting process? Some sort of boot camp? Stephenson brings out a document he says is an extract from Washington's orderly book, which contained orders from Washington to be distributed to the entire army. The top of the page is dated Cambridge, 10th March 1776, and we're led to believe it's all about the birth of the life guard. The commanding officer of each regiment had to give four men. There were twenty-seven regiments in the main army, so the first selection produced a little more than 100 men. Washington chose a little less than half of them. The date shown at the top of the document, 10th March 1776, does not appear to be the date of the orders for the creation of the life guard. March 10 had a couple of other items. The life guard seems to date from March 11, 1776, based on the wealth of transcriptions available online. (The document itself does not appear to be digitized and online, however.) I can't tell for sure if that is accurate, however, because all of the transcriptions differ slightly from the images shown on the program. It's possible the exact wording varied between the different commanding officers. What I have reconstructed below is based on my reading of what was shown (the best images I could capture are below), augmented by text in brackets from the earliest transcription I could find online, from 1836. The General being desirous of selecting a particular Number of men for a guard to himself & Baggage the Cols or Commanding Officers of each of the established Regts, the Artillery & Rifle men excepted, will furnish him with four. That the number wanted may be chosen out of them: His Excellency depends upon the Cols for good men such as they can recommend for their sobriety, honesty & good Behavior. He wishes them to be from 5 foot 8 Inches to 5 foot 10 Inches high handsome & well made, & as there is nothing in his eyes more desirable than cleanliness in a Soldier [he desires that] particular Attention will be [had in the choice of] such as are spruce & neat. They [are all to be] at headquarters tomorrow precisely at 12P [at] Noon when the Number will be [fixed upon. 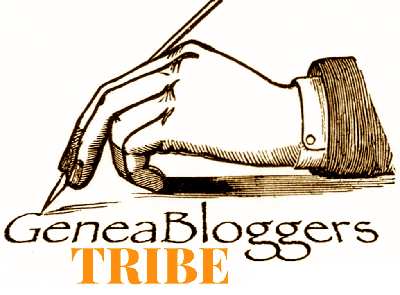 The] Genl. neither wants men with [uniforms nor arms; nor] does he desire any men to be [sent to him who] are not perfectly willing to be [— of the Guard.] They should be drill'd men. As Foley also had asked what sort of relationship Simon would have had with Washington, Stephenson explains that Washington had a somewhat aloof command style, suggesting that he was not particularly close to his men. The life guards' job was to protect Washington specifically, but Martha and the children were in Cambridge also, so keeping an eye on them was probably part of the responsibilities. Each of the men had to have a real commitment to the position. Overall, Simon is a great person to be descended from. Foley decides he really likes Simon, who was a respectable man. Then he wonders about the "drill'd men" requirement. That probably meant that they had some experience, which Stephenson confirms. Foley then asks whether Simon saw any action in the life guard. Stephenson says, "You bet!" The guard had a busy summer and fall in 1776. An assassination attempt was made on Washington, and on July 9 the Declaration of Independence was read to the army for the first time. This was when they learned what they were fighting for. Prior to this the battle had been to restore their rights as Englishmen; now they were fighting for independence, and it had become a revolution. On the personal side, in March 1777 Simon married Ruth Church. They were married 42 years and had thirteen children. Foley is amazed at the number but says that as a father, he respects Simon the most for that. He's impressed and proud. Ah, but now Foley wants more. Simon was born in Massachusetts, which means his parents were here. How far back can he go? Stephenson tells him that he's near Boston, the home of the New England Historic Genealogical Society (NEHGS). (And this time it really is close, less than 5 miles!) That's the place to go for answers about New England ancestors. As he walks away from the Longfellow House, Foley is amazed that he didn't know anything about his family and now has learned this fantastic story about Simon. That would be enough, but maybe he can go further back and learn even more. He's a little overwhelmed. His 5x-great-grandfather believed in the new nation and served with Washington, our country's first president. He will be proud to share with his children that someone in their lineage helped found America. The next day Foley is in Boston. He's still giddy about the story that ended yesterday but is looking forward to learning a whole new story today. He anticipates being excited, whatever comes his way. This tree begins with Foley's father and then goes to his grandparents Earl Hugh Foley, born March 9, 1907 in Bon Homme County, South Dakota, and Evelyn Miskle Fogg, born December 13, 1902 in Holland, Michigan. Next come Harrington Dingley (Dingley?! I guess that wasn't a B after all) Fogg, born February 5, 1866 in Kalamazoo, Michigan, and Mary Bliss Wardwell, born in Marblehead. The 2x-great-grandparents are Horace Ware Wardwell, born May 16, 1842 in Andover, and Sarah Jane Carmodie, born about 1847 in Salem, Massachusetts. 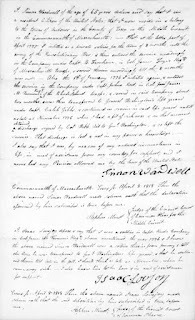 Horace's parents were Thomas Gage Wardwell, born October 13, 1814 in Andover, and Mary Hannah Goodwin, born November 3, 1819 in Saco, Maine. Thomas' parents were Simon Wardwell, Jr., born August 24, 1788 in Andover, and Margaret Barker, born February 3, 1794 in Methuen, Massachusetts. 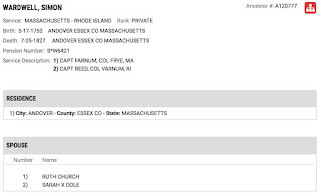 Simon's father was Simon Wardwell, Sr., born May 17, 1752 in Andover (we know a lot about him now), and his mother was Ruth Church, born September 1756 in Haverhill, Massachusetts. Simon Sr.'s parents were Eliakim Wardwell, born January 22, 1723 in Andover, and Mary Peavey, born March 22, 1724 in Andover. Next come William Wardwell, born November 9, 1679 in Andover, and Dorothy Wright, born July 23, 1688 in Andover. William's parents were Samuel Wardwell, born May 16, 1643 in Exeter, Massachusetts, and Sarah Hooper, born December 7, 1650 in Reading, Massachusetts. The final generation shown is Foley's 9x-great-grandparents Thomas Wardwell, born January 31, 1603 in Alford, England, and Elizabeth (no maiden name), born in England (without even an approximate year of birth). Foley zeroes in on Thomas Wardwell, realizing that is his immigrant ancestor. Norton confirms that and adds he was among the first settlers of Massachusetts. She goes on to say that Wardwell is a name well known in New England. In particular, Samuel Wardwell, Foley's 8x-great-grandfather, was very important. Foley is surprised and asks if Norton has heard of him before. Norton says he is well known and hands him a copy of a document. Foley asks what it is and begans reading it. I give him credit, he didn't do that bad of a job, but he stumbles over some of the words and asks Norton, "How do you read this?" 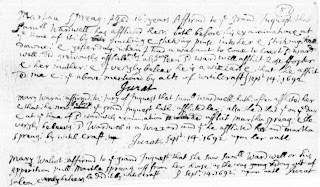 She admits 17th-century handwriting is difficult and offers Foley a transcription, which he gratefully accepts. 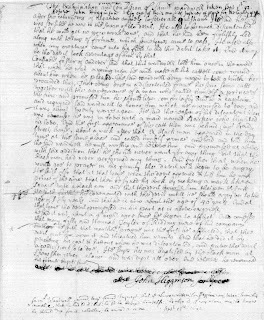 (You can read the transcription of this and other documents relating to Samuel's trial on the Salem Witch Trials site at the University of Virginia.) Foley reads "in the snare of the devil" and exclaims, "What is happening here? What is this?" The document turns out to be Samuel's confession of witchcraft, dated September 10, 1692. Foley's ancestor had been caught up in the infamous Salem witch trials. Foley admits he doesn't know details about the trials. Norton says that Samuel's confession came late in the trial period. The narrator steps in to tell us that the Salem witch crisis (I'm used to the events being called the Salem witch trials; is this new phrase, which was used several times in the episode, some sort of redefining of history?) began in February 1692, seven months before Samuel's confession. Everything started with two girls who made bizarre accusations of witchcraft against several people. They went into contortions and had screaming fits. A doctor said they were under the influence of evil, and events exploded into an atmosphere of fear and hysteria. The Puritan community believed God was punishing them and attempted to reaffirm their religious beliefs by going after those they believed were in league with the devil. They aggressively pursued anyone who was accused. Foley asks Norton whether Samuel was on trial. At the time of the document, he had only been accused, and he was confessing. At first he had returned "negative answers" to the questioning, that is, he had denied being a witch. He then admitted it, because up to that point, anyone who had confessed was not actually tried. The men leading the proceedings wanted confessed witches to accuse more participants. At some point after his confession, however, Samuel recanted and said he had been coerced. Unfortunately, between his confession and trial two others who had confessed were indicted and tried, so maybe Samuel decided his original plan was no longer going to be effective. He was actually tried. Foley is surprised that not only women were considered witches. Norton explains that anyone could be accused, and that one quarter of the accused were men. Foley is then concerned about Samuel's family, which must have been in huge turmoil. Samuel had seven children; how can Foley find out what happened to them? Norton tells him that the Salem Witch House is only a few miles north of where they are at the moment, and that he should go there and find out. He will be able to speak with Margo Burns, an expert on the Andover witch trials. Walking away from NEHGS, Foley wonders what Samuel's fate was. He hopes the family was able to stay together, for the sake of the chidren. Was Samuel one of the victims, or did he make it through? At the Witch House, Foley tells Margo Burns, credited as a historian of the Salem witch trials, the story of Samuel (which she obviously must have known already). She hands him a copy of testimony made against Samuel. (The two documents shown below are linked to Samuel's case on the University of Virginia site, where you can read the transcriptions.) Foley again does a reasonable job of reading the 17th-century writing, with assistance from Burns on occasion. On September 14, 1692, a 16-year-old girl named Martha Spriggs accused Samuel of pinching her, sticking pins into her, and striking her down. Foley is stunned that Martha actually believed Samuel was a wizard. He can't believe that she testified Samuel had struck her down and stuck her with pins. Burns tells him that the young girls were very dramatic in their testimony, screeching and contorting themselves. Amazingly, the court found their testimony credible, which Foley thinks is pretty scary. Burns brings out another person's testimony. This was from Ephraim Foster, a 34-year-old man. He stated that Samuel had told his (Foster's) wife that she would have five girls before she had a son, and that the same had come to pass. Samuel had told another woman's fortune. He had a reputation for telling fortunes, reading palms, and predicting what children women would have. Foster was a more credible witness than Martha Spriggs, and he lent credibility to the charges made against Samuel. Burns explains that the people at this time believed in an invisible world around them. Angels and demons were part of their worldview and were very real to them. Foley asks if a person on trial had an attorney. Burns tells him the accused could not have an attorney but could try to respond to the accusations made against him. After seeing all the depositions, Foley then asks what happened to Samuel. Instead of answering directly, Burns hands him a copy of a book. More Wonders of the Invisible World was first published in 1700 by a critic of the witch trials. It has many first-person accounts. The edition Foley is looking at is a later reprint. (This reprint is from 1823, quite a bit later. I think this one is the original 1700 version.) Foley reads short snippets from the book. Foley finds it "amazingly heavy" to learn that Samuel Wardwell was sentenced to death. The convicted were scheduled to hang. Burns says that it was the fourth hanging in the series of trials but doesn't specify whether that was in the entire proceedings or in Andover. Burns tells Foley that a total of nineteen people were executed in Salem. The hangings in September were the last ones. Foley asks whether Samuel has any kind of tombstone. Burns explains that those who were hung did not have graves; their bodies were discarded in a crevice or wherever was convenient. She adds that Salem has a memorial to the people who were executed. She recommends that he experience it. Foley is still somewhat stunned as he leaves. After all, you don't expect to discover that your ancestor was hanged as a witch. (This episode is an interesting counterpoint to that with Sarah Jessica Parker, whose ancestor was convicted but did not die, because saner minds were beginning to prevail.) He laughs and, realizing it must sound like an odd reaction, says he's laughing because what he has learned is so foreign to him. His daughter had dressed up as a witch for Hallowe'en, and everyone thought it was cute. Now he has a different perspective but maintains it was still cute, the distance from the actual event allowing for it. Foley visits the Burying Point in Salem, which was established in 1637. There's a regular cemetery, but there are also eight benches with the names of the eight people who were hung on September 22. The first one we see him look at is Samuel Wardwell's. He also looks at phrases incised in the stones on the ground: I AM INNOCENT; I AM WRONGED; GOD KNOWS I AM INNOCENT; I CAN DENY IT TO MY DYING DAY; OH LORD HELP ME. The words put a horror to the event for him; seeing the words etched in stone makes it so severe. Eventually Foley sits on Samuel's bench: "Just me and Sam on a bench." He muses over the fact that in Salem the memorial is a tourist attraction. People see the names, but they don't really mean anything unless you're related to them. Five days ago he didn't know anything about Samuel or Simon, and now his mind is blown. He had no idea he had such a connection to the history of our country. He plans to take the story with him from now on: "This is my story. And it's a damned good story." I mentioned in my post about Aisha Tyler that the Ancestry.com DNA commercials are better than the annoying one about the wrong draft registration card. I think I've decided that one of the DNA spots is becoming that annoying. It's the one with the woman who was so excited to find that she is one quarter American Indian and now wants to learn all about her heritage. Since there's no specific tribal information, just the overall "Native American" label, I found myself wondering whether the Indian pots and other items that are used as set dressing are actually related to the tribe or tribes for which she has roots. I also found it interesting that the "most shocking result" from her DNA test was the Indian ancestry, and not one comment about the 8% African. Pretty amazing that I happened upon your post... I'm a big fan of the show, and I'm as much of a genealogist as you'll find. My great-grandmother, Florence Belle Fogg (1892-1967) was the sister of Evelyn Fogg, so I share all of the same Fogg ancestry as Scott Foley does... I'm so grateful to have my past research confirmed -- I knew that I was descended from Harry D. Fogg and his line, but it's great to see everything that went before. Thanks for posting this! I may not have ever seen it, but for your post. My first name (nickname) is Kip, and my last name is Van Blarcom. You are welcome, Kip! I'm also glad you found the post. I guess you have a little more information than you did previously, and make sure you download the available documents. Foley's two ancestors sure made for an interesting contrast on this episode. Thanks so much for your humor and observations. I watched the Jean Smart episode with the Salem Witch Trial connection and remembered that Scott Foley was my connection to that period. Samuel Wardwell was my 7X Great Grandfather. I appreciate having your added information. I looked at my tree and realized that I have not yet added this information for Samuel. Thanks so much for your summary of this episode. Thank you for writing! I'm glad you found my post interesting and informative, and that my sense of humor carried through. I hope you've entered all that additional information!